From my perspective if you are a teacher (and let's think broadly about that term as well) then you are a leader and that is a tremendous privilege and responsibility. Recently I attended a presentation about successful educational leadership with associate professor Ross Notman from the Otago university. He presented findings from his own research as well as international research including the International Successful School Principalship Project. As we went through there were opportunities to reflect on our own leadership practices and experiences of leadership, in this time I often came back to the thought that these qualities are not the exclusive domain of successful school principals. In the classroom how do you share your expectations? How do you motivate your learners? Are you clear about why you are doing what you are doing? And how do you communicate this with your class? When we set clear expectations our students have confidence to complete set tasks. When they know why we are doing what we are doing there is a better buy in and if well thought out with them in mind then the learning will have greater relevance and therefore be more meaningful. Motivated students are more likely to be self managing and committed to the task at hand, whilst we don't want to create a dependence on us for motivation it is important that we support the students to get on board and stay on board. We can use WALTS (We Are Learning To Statements) to help clarify the our expectations, we can use rubrics and tools like SOLO taxonomy among others. When talking about expectations we are not only talking about teaching and learning, there are behavioural expectations as well. One important thing to consider about expectations and is that unless these are held/owned by the whole group then they are unlikely to be motivating or sustainable. The three R's of teaching is sometimes described as relationships, relationships, relationships. I agree! The fabulous Allie Mooney shared the following quote at a conference I attended many years ago "you need to reach me before you can teach me", I have never forgotten it. How do you build relationships with your students? It is not about being friends but getting to know each other. How do you develop dispositions in others? What about valuing all the students in your classroom? Do you practice what you preach? If we know what switches people on and turns people off we are better able to help them stay motivated and share a vision that is palatable. When you are teaching is your focus on the subject/topic or the different learners you have in your class? Where your focus is will make a huge difference to the quality of the relationships you have with your students. It is not always easy to like all the children/young people who enter our classrooms, some come with some pretty tough baggage, it does help though if we approach all students with a desire to identify their strengths and unique gifts as everyone has something of value to offer. A question I have gained from a parenting expert Dr Monika Potter is to ask yourself 'what would love do? ', it is a helpful reminder when dealing with difficult behaviour. If we want our students to walk along a path with us, to respect and respond, then we need to be authentic... they can smell the disingenuous a mile off and if we don't practice what we preach then that will erode trust which is one of the foundations of relationships. It is OK to be human and make mistakes, admit it, apologise and move on if you do... in just the way you would expect your students to make amends if they made a mistake. This is where we are establishing collaborative cultures, restructuring to meet changing needs and managing conflict. How do you create opportunities for collaboration in your classroom? What about distributed leadership... do you share ownership? How do you identify the needs of the learners in your care? What do you do about changing needs? How flexible is your classroom programme? How do you manage conflict? Do you create opportunities for honest, healthy discourse in the classroom? We can be the masters of all destiny in our classrooms but when we do that we disempower our learners. Think about ways that we can share decision making with our students. I remember with one class giving them some guidelines for choosing desk groups then let them go for it, I was impressed with the quick way they selected their groups and how successful they were. Collaborative cultures take time to build and it is important to work on creating an environment where it is safe for students to disagree or have different opinions even with the teacher. When groups go too far with their desire to reach consensus we start to lose divergent, innovative thinking as the need to fit in with the group supersedes anything else. This is called 'group think' which I would imagine as teachers we would want to avoid developing in the minds of our young people if they are to be the leaders of the future. Teachers have a lot of competing demands on our thinking when planning for our students so consider how much of what you do in the classroom is driven by student needs. When you are thinking about needs are you only concerned with the academic or do you look at the whole person? I suggest that if you are not considering the social, emotional, physical aspects of your students lives you might be missing out on some important information which will enable you to better tailor your programme to meet diverse needs and help your students do their best. If a child is struggling with their learning sometimes the root of the problem may not be the subject area or lack of ability but could be a health issue, problems with friends, or any number of things going on. Focusing only on the academic may lead to little improvement or, worse still, increase anxiety and create more problems. This brings us back to knowing our students and relationships, relationships, relationships. There are many other qualities we could discuss including being leaders of learning, modelling an inquisitive mind, thinking dispositions and so on but I think this is a helpful start to establish the understanding that teachers are leaders. These qualities can equally be applied to parenting and other contexts I am sure. Leadership for me is a learning journey. I see so many opportunities in everyday life to apply aspects from my learning in leadership so far. 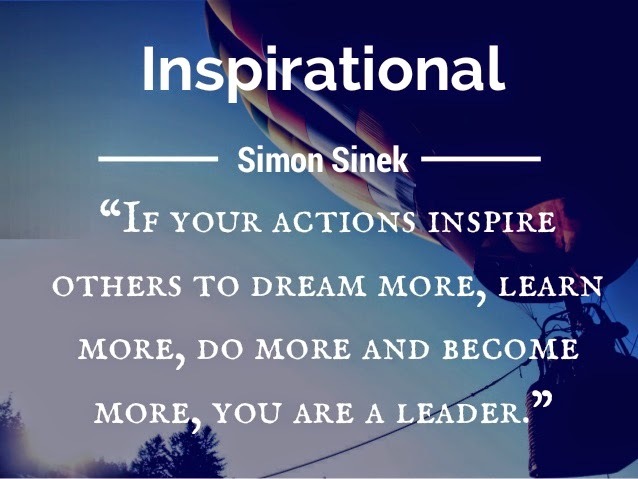 If you are interested in exploring leadership a little more I suggest that Simon Sinek's leadership material is a good place to start. 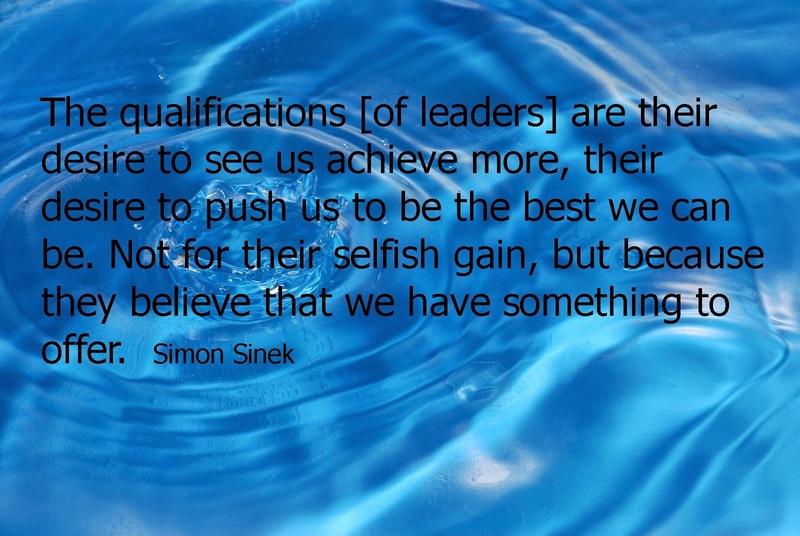 Simon Sinek shares valuable insights around leadership and is well worth following. Pleased you asked Karen... this is what I am planning around :) Looking forward to the Teachers Matter Conference 2015... not long now? !